There were all kinds of reports flying around this morning that Meghan Markle is in Toronto. She is NOT in Toronto. But she was in Italy. Prince Harry and Royal Meghan arrived in Lake Como to visit George and Amal Clooney on Thursday. They left yesterday at 6pm. There are currently no plans to go to Toronto or to Los Angeles. They will likely be spending some time at the Queen’s summer home in Balmoral soon. And next Wednesday they’ll attend a benefit performance of Hamilton in the West End in support of Sentebale. Let’s focus instead then on the Clooneys and the Sussexes getting closer. And partying. George and Amal are parents now yes. And, sure, the pace may not be as frenetic as it once was. But they do like a boozy night with friends. They’re accomplished hosts. They love to host, they love to entertain. And they have continued to entertain when the kids go to bed. Do you think they play board games? I feel like they’d be great at board games, especially Amal. I would like to believe this. That when the Clooneys and the Sussexes get together, they go hard for hours playing Codenames. As for Amal and Meghan together, well, that’s a power friendship. 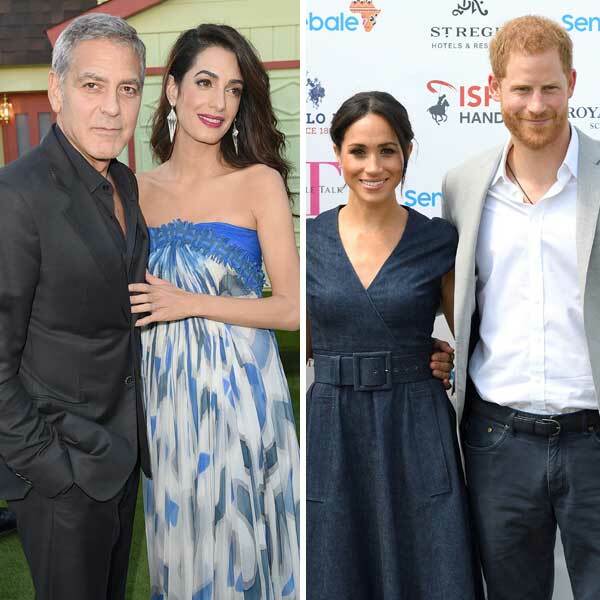 George and Amal were at the wedding, yes, but we’ve yet to see a photo of Amal and Meghan side by side. This is becoming the new money shot.